Dorcas is such an amazing planner and I would recommend her 100%. We worked together on a styled shoot and she was so organized, patient, and so detail oriented that for sure will blow your mind on your special day! I can't thank her enough for letting me work with her. I look forward to using her in the future! Where to begin!!?? I wouldn't get married without her!!! She genuinely cares about your details and thinks of things you would never consider!! Highly professional and creative!!! Kemi was so down to earth and so understanding. In the short amount of time that we got to know each other, it was like we had known each other for a while. She was so understanding when it came to areas in which I was lacking during the wedding planning process. Thank you for the professional touch you displayed in the planning and execution of the event. That everything went on smoothly was a testament to you and your crew. I will be recommending you to people henceforth. Keep up the good work! It was really nice working with a real professional. You made everything look easy. Thanks alot! Kemi did a wonderful job planning my 40th birthday. It would not have been possible without her and her team. Kemi was always a phone call away. I know I can count on her to plan any future events. 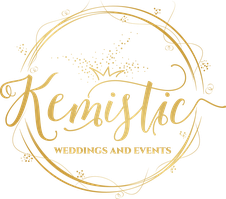 Please hire Kemisitic Weddings and Events for your next event! Kemistic Weddings and Events saved the day once again!!! I am good at everything but planning my son first birthday party was ...... Kemi of Kemistic event turned a disaster into an fun filled day. From her planning to the decor to the games, her choice of vendor(thumbs up).. impeccable service. Thank you for making AJ's 1st bday very memorable :). it would have been a mess if it wasn't for you. We are definitely using you for all our events and highly recommend you to anyone planning an event. Thanks Kemistic Wedding and Events. You rock.